As part of Steam's regularly awesome Midweek Madness sales, the Best of British Indie Bundle packages seven indie games crafted by the skilled folks across the pond. Lasting until 4pm PDT Thursday, the $10 deal provides a sampler of excellent strategy and action timesinks, including Introversion Software's DEFCON, Alex May and Rudolf Kremers' Eufloria, Mode 7's Frozen Synapse, Positech Games' Gratuitous Space Battles, Puppy Games' Revenge of the Titans, and a double-whammy finisher of Size Five Games' Time Gentlemen, Please! and Ben There, Dan That! The value-candy gets even sweeter as most of the included games (with the exception of Gratuitous Space Battles and Size Five's goods) carry Steam Achievements for your hunting pleasure in addition to saving nearly $70 in your still-recovering-from-Summer-Sale wallet. Simon Roth is best known as the newest recruit to Frozen Synapse creators Mode 7, but he’s also one of the most veteran developers in the entire history of the world, if my research is correct. And he’s moonlighting on a side-project all of his own, the Bullfrog/early Maxis-inspired sci-fi management game Maia. This isn’t a matter of keeping colonists happy with space ice cream and zero-grav toilets – we’re promised the likes of ‘up to 2KM X 2KM X 2KM of procedural world’, water and lava simulation, defensive structures to fend off hostile wildlife, bipolar robots and a first-person mode. "Owen. You killed Davis!" Alas, poor Davis, the VIP Owen and Tom F were supposed to protect lay dead, victim of a grenade throw gone bad. Who could have imagined that a convoluted plan to bounce a grenade off a fellow soldier's riot shield through a window could possibly go awry. Such was lunchtime in the PC Gamer office today when we tried out the New Red expansion for our strategy game of 2011, Frozen Synapse. Find out exactly what went down in Tom's account. It also adds red mode. What does that do? "IT MAKES THINGS RED" say Mode 7 in the Frozen Synapse Red trailer. The expansion is available to buy now for $9.99 from the Mode 7 site and Steam. Frozen Synapse's new DLC adds co-op play and a new shield unit. Owen and I tried out both at lunchtime, with disastrous results. Our 20 minutes of planning resulted in the 33 seconds of catastrophe below, so I should explain what the hell we were planning. Our objective was to defend the NPC (cyan coloured) from incoming attackers, so I said I'd hold the north (I'm in green) and Owen (yellow) would hold the south. My plan was solid: my machinegunner would provide overwatch from behind cover, my shield unit would block the only north entrance, then drop her shield a second before the turn ends, so my grenade guy could fire past her to flush out anyone who was hiding from my gunner. It didn't go well. My shield unit put her shield back up at the end of the turn, ricocheting the grenade back at us. It didn't blow, but in my next turn, I have a very large and explosive problem at my feet. Meanwhile, Owen was taken by surprise when an enemy shotgunner ran right up to the south wall, hugging it so he could peek in and blast us at close range. Shotgunners beat everything at close range, so Owen had to do something inventive. He moved both his shield and grenade units away from the windows, and had the grenade one shoot at the shield, angling it to ricochet out of the window and blow up the shotgunner. I was impressed with his guile. What I didn't realise was that he hadn't simulated this. You can share your plan in co-op, so you can see how it'll play out, but only for the next five seconds. The grenade didn't land in that time, but I assumed Owen had seen from the trajectory that it would sail clear out of the window. It tinked pathetically off the shield and fell at its owner's feet. So in the same turn, both of us had to escape deadly blasts of our own creation, while enemies flooded in. The difference was that my blast didn't kill the NPC we were here to protect. What I love about the video is that it looks like Owen's two units disagree: the grenadier wants to do the shield-bounce, and the shield lady is having none of it. My guys manage to survive by dashing round a corner and huddling behind their shield, but it's no help: the mission was the NPC, and we killed the NPC. The new DLC is called Red, and it's $10 if you own Frozen Synapse. If not, you can buy both together for $27. They're also both on Steam. The indie darlings of yesteryear are back with a vengeance. I mean, with titles like Wrath of the Lamb and Red, what else could they possibly be out for? A pleasant stroll? A picnic? No, this is a declaration of war – or at least “Hey, we still exist. Notice us>.” And I have! So everything worked out. Thank goodness. 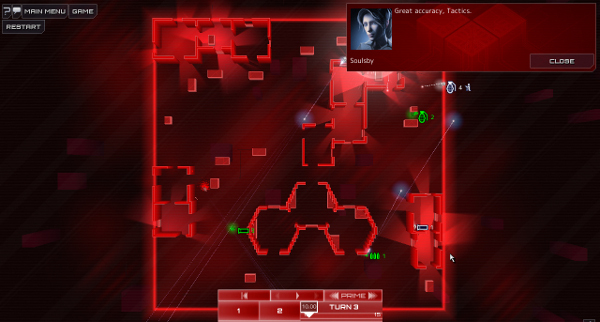 And wow, Frozen Synapse: Red, I must note in my trademark eloquent and considered fashion, contains a lot of stuff>. Foremost, the entire single-player campaign’s been retrofitted to include co-op, and there’s now another 15-mission campaign to top it off. You’re also looking at challenge missions, mutators, deployable cover, riot shields, and a new multiplayer mode. But most importantly, levels can be red now. Yes, that’s right: Mode 7 has included a new color>. Take that, Unreal Engine 4. Daily Deal - Frozen Synapse, 66% off! Today's Deal: Save 66% off Frozen Synapse!